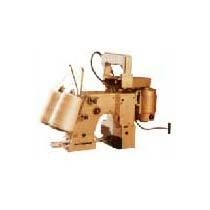 Our Double Thread Bag Closing Machine is made up of anodized chromium parts, thus ensuring a long working life. 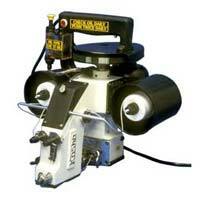 It is light & portable and works at a high speed of 300 bags per hour. It is easy to operate and is available at reasonable rates. This is used for heavier bags - where for double protection - a double line stitch becomes necessary. So that if one line of stitch opens during material handling - there's still one more line of stitch for secondary protection. A novel new design, this machine affords the user: comfort, ease of use & a feather-lightness on the hands. Just strap machine belt on the wrist & you're ready to go. When bags are really heavy (up to 100 kgs) or bag is stuffed with material, then a stronger stitch is required to hold the material in the bag. This is possible by fortifying the stitch with not 1, but 2 Threads. If the material you are packing is precious or expensive. If you're worried for the bags tearing open or bursting during transit. If your bags are going to go through a lot of handling (or manhandling).